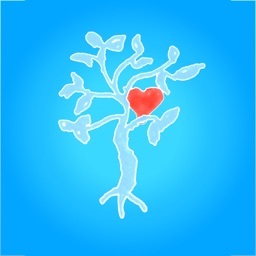 Winner of the About.com "2013 Readers' Choice Award" for "Best Pregnancy App"! 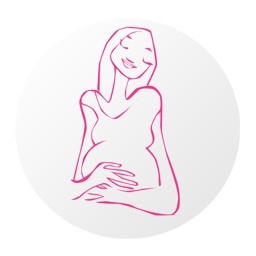 Awarded as one of the "Top 25 iPhone Apps for Pregnancy" by Babble.com -- stating that Babyface is "a prime source of reliable information and/or entertainment for pregnant women on-the-go." 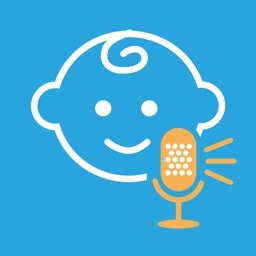 "...you'll be giddy at the sight of the newest app for mommies and daddies-to-be: Babyface"
- Pregnancy & Newborn Magazine's "Baby Buzz" blog (pnmag.com). WHAT WILL YOUR BABY LOOK LIKE? TAKE A LOOK INTO THE FUTURE! 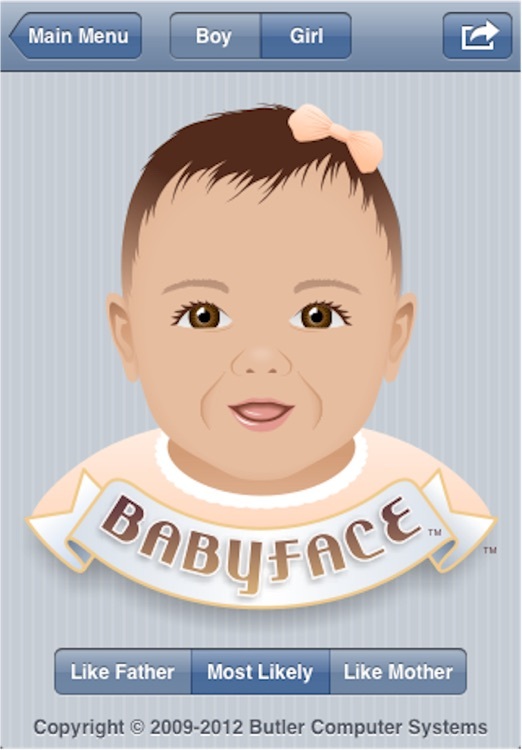 BABYFACE™ WILL CREATE A FULL-COLOR CARTOON-LIKE DRAWING OF YOUR BABY'S FACE! IT'S FAST, EASY, FUN, & SOCIAL! While you listen to a beautiful lullaby, enter 21 facial traits from each parent (eye and hair color, skin tone, curly hair or straight...even freckles or dimples). 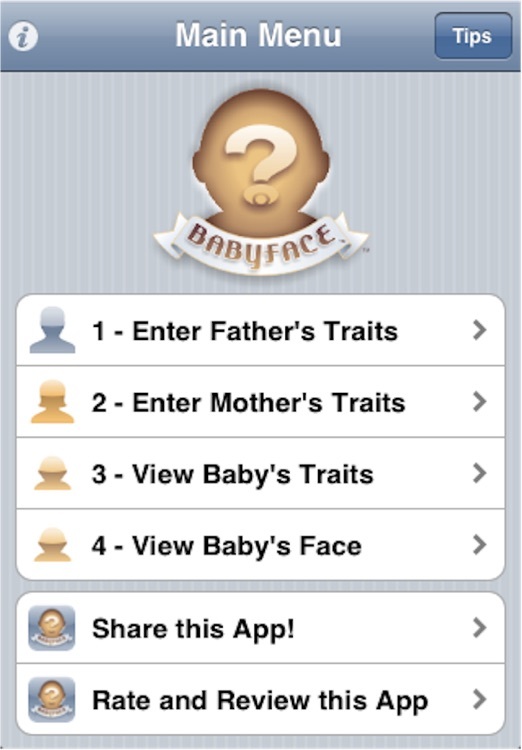 BABYFACE then uses Mendel's scientific theory* of dominant/recessive trait inheritance to automatically determine your baby's most-likely facial traits, and shows you which parent will give your baby each trait. 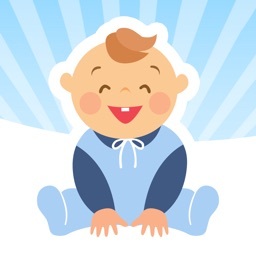 This amazing app then creates a truly unique full-color cartoon-like drawing of your baby that you can post to Facebook or Twitter, sent to your friends via e-mail, save to your device's photo album, or copy to your device's clipboard for pasting into another app or document. 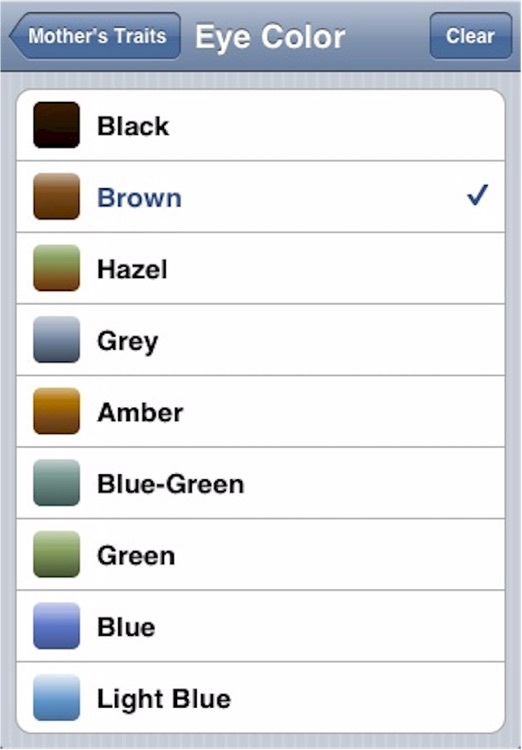 (For a sample drawing created by BABYFACE, check out the screen shot of the baby girl shown on this page.) 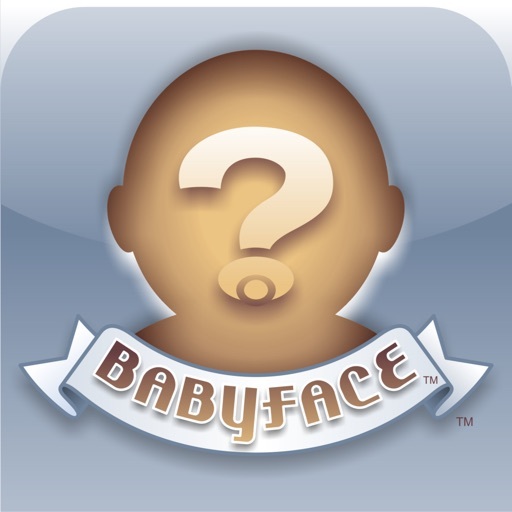 Whether you are pregnant now, thinking about it for down the road, or just imagining a world of possibilities...BABYFACE is flat-out fun for everyone! IS THERE ANYTHING MORE ADORABLE THAN A LAUGHING BABY? To hear your baby laugh/giggle, give you a kiss, make the "raspberries" sound, sneeze, or hiccup, simply tap your baby. You KNOW that YOUR baby will be the cutest baby ever, but what (and who) will he/she look like? Your curly hair? His freckles? Blue eyes or brown? Now, thanks to the BABYFACE, you can heighten the thrill of expectation with a full-color drawing of your coming bundle of joy. You’ve read the “What to Expect” books...seen the in-utero photos of each stage of development. But, as informative as those illustrations are...they can’t capture the special-ness of YOUR baby. Thanks to BABYFACE, you can get an amazing drawing of YOUR baby to treasure and share with family and friends. GRANDPARENTS: EXERCISE YOUR BRAGGING RIGHTS! * SCIENTIFIC NOTE: The Mendelian dominant/recessive trait inheritance model, upon which Babyface is roughly based, is widely accepted and highly respected by genetic scientists. 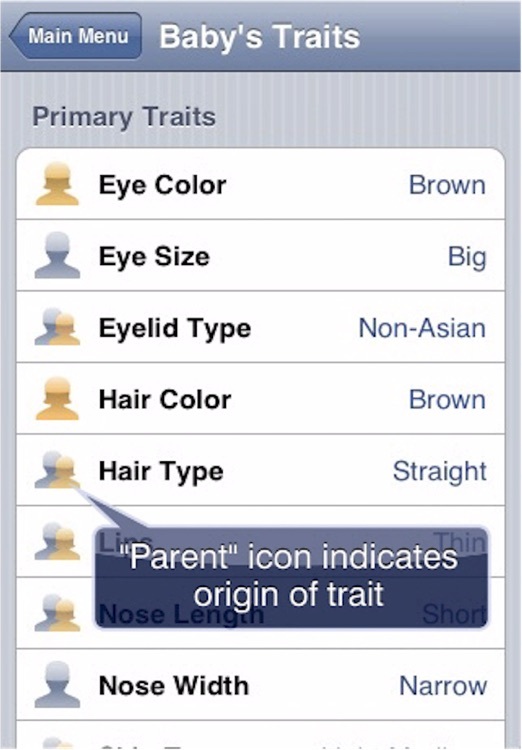 However, the prediction of inherited traits is not a perfect science. 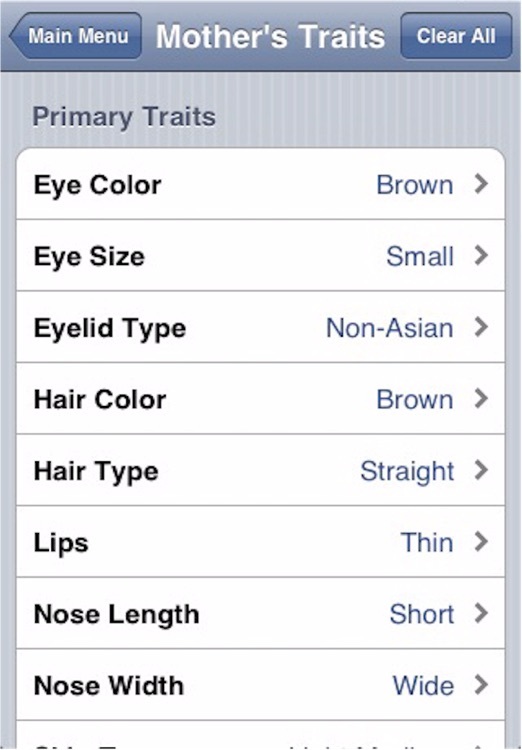 Some traits can be predicted with reasonable consistency, while others (such as eye color) are so complex that a simple dominant/recessive analysis can be considered little more than an educated guess. Furthermore, traits such as hair and eye color can change throughout a baby’s first few years of life. Thus, the predictions made by Babyface may not always be totally accurate...just totally interesting and totally fun!